After local residents and community organizations began organizing to bring bike lanes to East New York and Brownsville last year, NYC DOT is developing a plan to stripe the first bike routes directly through these neighborhoods, and more could be on the way. The process underway in eastern Brooklyn offers an intriguing glimpse at how the city can develop neighborhood-scale bike plans — especially promising for areas with high rates of chronic disease, where safer biking and walking can encourage more physical activity. About 20 people gathered at the YMCA on Jamaica Avenue yesterday evening to discuss what’s holding East New York residents back from biking more, and to share ideas with DOT and the Department of Health about how to improve local cycling conditions. They heard from DOT about two bike routes that are in the works and hashed out where they think more bike lanes should go. The Department of Health is taking an active role in East New York because residents have higher-than-average incidences of chronic diseases like diabetes. According to department surveys, local residents report lower than average levels of physical activity, and DOH has identified street design as a major factor. Currently there are no bike lanes in the neighborhood, and many street crossings pose a challenge for pedestrians. Working with local organizations like the Brownsville Partnership, the Cypress Hills Local Development Corporation, and the Pitkin Avenue BID, DOH and DOT put on a group ride around the neighborhood last October and distributed surveys to find out how local residents want to improve local biking conditions. As a result of those surveys, DOT identified two routes to serve as the backbone of the neighborhood bike network: a north-south route on Mother Gaston Boulevard and an east-west route on Pitkin Avenue. Both would consist of painted bike lanes between the parking lane and traffic lane where the streets are sufficiently wide, and sharrows where the streets are narrower. DOT has also mapped out locations for bike racks, which are currently very scarce in the neighborhood. The tentative plan is to show the bike routes to Community Board 16 this fall in preparation for spring 2013 implementation. That could be the first phase of a three-year plan to fill in neighborhood streets with several more options for safer cycling. The goal, said DOT, is to create neighborhood-scale bike networks that connect to the citywide network. Most of yesterday’s workshop was devoted to refining the preliminary ideas for the neighborhood bike network. 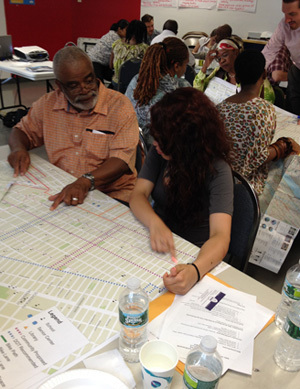 After reviewing a map of several bike routes recommended through earlier surveys, participants focused on the need to create good connections between East New York and Brownsville and other neighborhoods. They asked for safe routes to Highland Park, on the north side of the neighborhood; to the Eastern Parkway greenway on the west side; and across the heavily trafficked Linden Boulevard to the south. They also asked for bike racks at every school in the neighborhood. If the young people apprehended don’t have identification — and many of them don’t, Smillie said — they have to spend the night in a cell at central booking in Downtown Brooklyn. “It discourages a lot of people who want to ride,” he said. The partner organizations working to improve bike conditions said the local Precinct Community Council has supported their efforts and could be an effective liaison to get police to stop harassing young people on bikes. That last comment regarding harassment by the NYPD is disturbing. Besides that I hope that efficient connections to existing greenways, bike lanes, and go-to destinations will increase the number of bicyclist in the area. The characteristics of Brownsville/East NY make bicycling an effective option for commuting and recreation. I attended this meeting and the spirit of collaboration and sharing was excellent. Both the departments of Health and Transportation were on hand to help with discussions and to hear ideas. This area (East New York/Brownsville) is currently totally devoid of bicycle infrastructure, so any addition of lanes will be a great improvement. The model of a multi-year neighborhood-wide network build-out is promising, and could be used in other parts of the city where fitness and health issues are a big concern but a scarcity of bike lanes have made it difficult for folks to bike. Some examples of other places where this model could be used in the future: Harlem, Bed-Stuy, Sunset Park, Cypress Hill, Woodside, City Line, Woodhaven, etc. etc. What other neighborhoods in the city are bike-lane deserts that could also benefit from this kind of approach? Bike lane deserts? East Bronx has a good number. Personally I would love to see an off street (Protected or Greenway) from the East Bronx into Manhattan. As it stands you must utilize Southern Blvd which is very busy. A protected lane along that route or under the Bruckner would be excellent and encourage BX>MN commuting. East NY/Brownsville could also use a direct protected Manhattan bound connection. The outer boroughs need protected lanes. Wait, riding on the sidewalk without identification is enough to have you put in jail…?! In some of the most underserved neighborhoods aggressive poor-people-first strategies are the most effective strategies for rapidly elevating the quality of life of all New Yorkers where great simple human-powered net zero mobility comes at minimal cost. Biking While Black — the stop-and-frisk quota-fillers dream. Imagine how many people would go to jail if the cops set up at an intersection and pulled over every car that ran a red or exceeded the speed limit, sending every driver who wasn’t properly licensed or registered or wasn’t carrying ID down to central booking. Aside from that, this is great news, and I urge NYCDOT to make the installation of these lanes a top priority. I know white people who have been caught up in that riding across the sidewalk from the bike store to the street nonsense in Park Slope. And yes, no ID=lockup. It really is an FU from the cops to cyclists, the businesses, and the neighborhood. They really don’t care if anyone has any respect for them as long as there is fear.